HABIT: Large sprawling vine with showy orange and red trumpet like flowers that bloom all summer. Climbs by aerial roots. Bare in winter. Native to the easy coast, Florida and Texas. ‘Madame Galen’ introduced by French nurseries doesn’t spread as much as the native plant. C. radicans ‘Flava’ has pure yellow flowers. C. x ‘Crimson Trumpet’ is a pure red. CULTURE: Easy to grow in any soil, drought tolerant. Prune back to the main trunk after leaves fall in the spring. Does best in full sun. 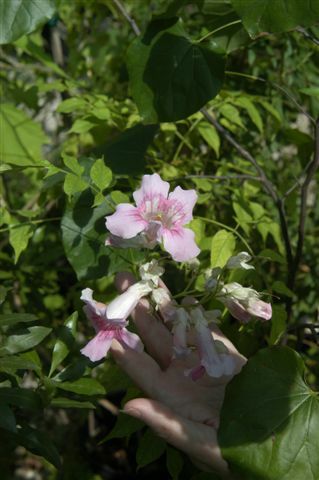 USES: Climbing vine for fence, arbor, screens or poles. Summer flower color. The pink variety is not hardy and should be used as an annual. PROBLEMS: Native plant spreads badly to become a huge pest causing a severe maintenance problem. This vine is horribly invasive and difficult to get rid of. The only solution short of a concrete wall in the ground is to remove the mother plant and spot spray the small shoots that return with the vinegar herbicides. ANSWER: There is only one solution: Dig it out. 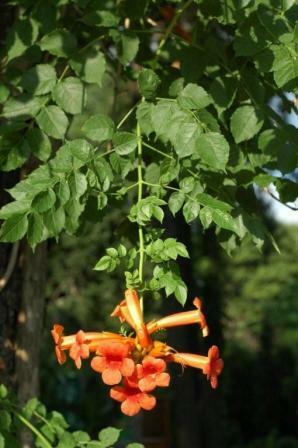 Neither organic sprays nor chemicals will kill the trumpet vine without hurting other plants.